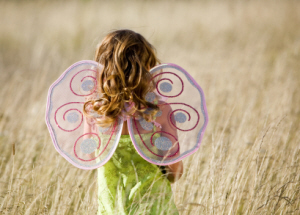 Flitterific Baby Fairy Costumes: Which Fits Your Pixie Best? Which Fits Your Pixie Best? 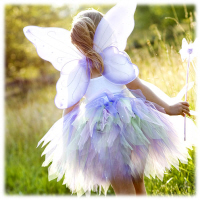 We've got three fields of baby fairy costumes to flutter through. Will you glide towards Queen Clarion's sophisticated grace? Rosetta's southern charm? Or Tinkerbell's hands-on creativity? 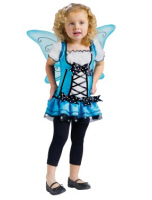 Your little pixie will light up the block this Halloween. If there's one thing I know, having three girls, it's fairies. Some moms can repeat all the Thomas the Tank Engine characters by heart. Queen Clarion's elegance ~ Her fairy costumes are a burst of grace and sophistication. They are fashion statements. Rosetta's charm ~ Her wardrobe contains charming designs more affordable that Queen Clarion, but still worth their weight in oohhhs and ahhhs. Tinkerbell's creativity ~ Do you like to "Tinker" with costumes at home? I've got the sewing patterns for all the most-popular Disney fairies. Queen Clarion is the top-fairy-dog in Neverland, the ultra-elegant flowing fairy all the others aspire to be. If Audrey Hepburn were a fairy, she would dress like this! These infant fairy costumes carry the same kind of grace and elegance. They are expensive (so don't be surprised) but definitely move baby fairy costumes to a new level of gorgeousness and class. Click on the photos below to see the details of each. Since there are almost no baby fairy costumes in newborn size available for purchase, I recommend that you piece together your own little masterpiece. Arrange her in a wicker basket lined with silk, and turn those ordinary photos into stunning artwork to display around the house. Everyone will think your newborn was an Anne Geddes model! Woodland fairies are perhaps the hardest to spot, blending into the woods so well. Help your little woodland fairy stand out in a big way. 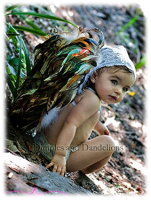 These feather wings add a touch of realism to an otherwise cartoony line of baby fairy costumes. If animal-talent Faun lived in my backyard, I have no doubt that she'd look like this. If you're seeking sophistication for your older baby, send her measurements in for a handmade pixie costume she can play and pose in. There's the lavender, pale pink, and mint colors pictured (click the pic for details), or the pink, pink, and more pink version you can see here. Both costumes come with the tutu, fanciful crown, wings, and magic wand. Rosetta has been my girls' favorite fairy for 3 years now, and there's no chance she'll budge soon. She strikes me as the well-dressed bargain-hunter kind. The type of fairy who can make the clearance rack look like it's really the designer rack. In this section, I'll pull out some baby fairy costumes that are provide the awwww without the price shock. ...I had to start with the rose fairy baby costume. Isn't this just so cute! The costume is currently on clearance, and includes the skirt and top, bloomers, headband, and rose scepter! The one thing this doesn't include, which makes me sad, is the wings. But heck, that's what the Dollar Store's for, right? There's only one official baby Tinkerbell costume out there (unless you sew your own), and this is it. It's lime-green, with a sheer pink overlay on the top. The wings are attached to the dress and Tinkerbell is flying across the bodice. Shoes are not included, but a simple pair of white flats would work beautifully. This fairy dress has layers of glittering purple "petals" and comes with matching green leaf booties, petal hat, and attached wings. Use it for Halloween, and then again for her first birthday (with a fairy theme of course...). This shimmering little tulip has a green leaf collar that matches little leaf fairy booties, a pink petal hat and attached wings. It measures 24" around the waist. You may wish to break out the measuring tape to make sure it will fit. This is one of the most unique baby fairy costumes: bright blue with bold polka dots and bows. It's better for older babies, who are closer to 18 month or 2T size clothing. The costume includes both the dress and the wings, but not the leggings (which I recommend using) or shoes. Surprisingly, if you want the real-deal Disney baby fairy costumes (other than Tinkerbell above), you're going to have to dust off the old sewing machine. You can create nearly exact replica costumes of the fairies in the movie (which means a baby Tinkerbell costume, Rosetta, Iridessa, Faun, and Silvermist) by using a Simplicity Pattern. Get Ready for an AWESOME Halloween! If you're going to choose one of these baby fairy costumes for Halloween this year, make a portrait appointment now. She's going to look so flitterific you'll deeply regret it later. I'll stop saying flitterific now.